The tour guide information Koh Samui!! Samui sightseeing which arranges, Tao, and Nanyuan island, Angthaong National park snorkeling, elephant riding and safari tour, golf, and spa. Most pleasant unique safari tour in Koh Samui. 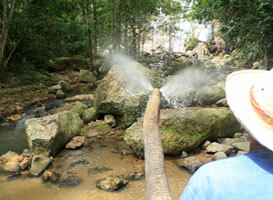 Namuang waterfall, and an elephant trekking -- in great fear - the tour excited excitedly.